*A good point Sharon has made... Since my recipe was continually being reworked and adjusted, while I built 45g starter to use a fraction of it for a no knead very long bulk ferment bread but ended up using all of it, that doesn't mean what I had left was the full 45g. Starters lose weight when fermenting. So when I used ALL of it that doesn't necessarily equate to 45g. If you build extra and use 45g, instead of my recommended build, then you might be using 5g or so more starter. 1: Autolyse the flours, water and starter for 1 hour. 2: Add the salt and combine. 3: An hour after adding the salt perform a letter fold stretch and fold one way then the other. 4: Perform a stretch and fold every hour. 5: Bulk ferment for a total of 6 hours from the start of the Autolyse. 6: Pre-shape and bench rest for 20 minutes. 7: Shape and final proof in the banneton - 1 hr 30 min at room temperature then 1 hr 20 minutes in the fridge. I was aiming for longer at room temperature but my dough was moving fast (faster than Trevor's Champlain). It was almost done after 1 hr 30 min so I put it in the fridge as I like to bake a cold dough. It's better! 8: Bake using usual method. Oven spring was very good indeed, good crumb structure, handled well and what's most important is a lovely flavour with a tang more akin to yoghurt than vinegar. This certainly was an evolving recipe. sometimes these workout best. When I put pen to paper (or keystrokes to word document) I estimate what might be a good hydration since I've gotten to know how hydrated I like each flour but sometimes it needs slight adjustments by feel to take into account the variables. This dough certainly behaved very well. That's a beauty!! You must be very pleased. I wish could taste some just about now. Best it's marvelous toasted as well. It certainly rose to the challenge in the oven. Was concerned that the extra spelt and rye might inhibit some oven spring but it jumped off the baking tray. Looks perfect. You should also post the loaf. It is beautiful, as is the crumb. I think sometimes sour tasting sourdough gets a bad wrap from people who claim to not like the sour flavor. If those that claim to dislike the sour flavor have not tried the Lactic side of sour they owe it to themselves to give it a try. There are two basic, distinct sour flavors. One I consider sharp and tangy, the other smooth and yogurt like. I personally, don’t care much for the sharp, tangy sour. I just thought of a good analogy. We all know the different flavors of sharp cheddar cheese and mild. I think the sourdough sours could be considered similar in differences. Anyone agree or disagree with that? Any other analogies that might explain the differences? I find that flavors are difficult to communicate in words. Agree 100%. One can bring out a less harsh tang which makes for a very tasty loaf. High hydration starter and a warm ferment. This bake took a few turns but it turns out - all the correct ones. I'll post that other photo. That’s a beautiful crumb and I am sure it tastes great! I'm always a tad nervous when cutting into it. What will the crumb be like? Lovely when it turns out just right. Tastes lovely. Surprised myself a bit too. I like the increase in rye and spelt, and it is at a level that doesn’t seem to have made handling a challenge. the rye starter would add to the flavour too. I've got a new starter routine. Used to have one rye and one wheat but I've combined them and just maintaining one whole rye with minimal fuss. From that i'll build other "bespoke" starters for different recipes, such as this. but from now on I'm only maintaining this one purely to use as a seed culture. The increase in wholegrain flours added much flavour without reducing the handling ability at all. I'm learning to use very little flour in the shaping process. Abe, your posts are always interesting to come across as your always trying something new! Well done! Lately I've been trying to use my starter with more thought about the final taste rather then stumbling across flavour. This is helping me a lot. Beautiful loaf Abe! Really you should be so proud! Well worth a try. Going to enjoy some for dinner now. I baked something similar this weekend and the process was new to me. Just to clarify, you don't really knead the dough, just do a few stretch and folds every hour, is that right? 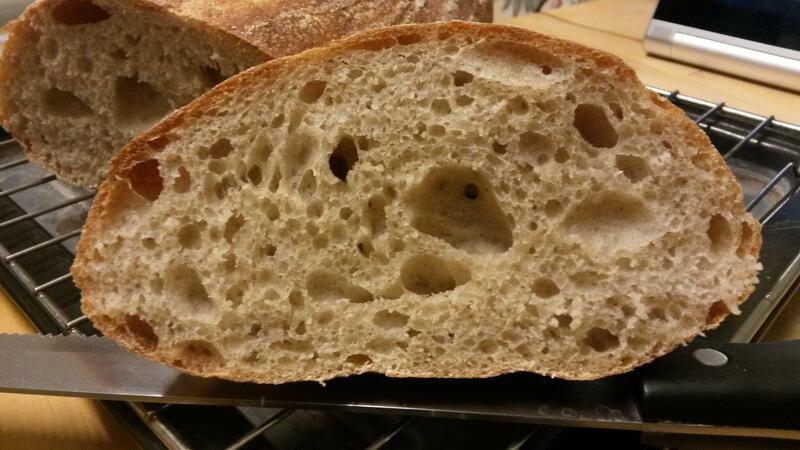 Manages to knead the dough and still get a beautiful open crumb when I do so things don't work as well for me. So for this loaf I did the minimum while incorporating the salt just to make sure it's well combined and developed the gluten with stretch and folds. I could see after the autolyse that the gluten development was well in the way and since it was a long bulk ferment I knew it'd be no issue with no kneading. So after squeezing, folding and a minute or two of Trevor's "kneading" method that's all I did. Good to know. It just felt so weird basically mixing it and then only doing the occasional stretch and fold. I kept thinking there was no way it was going to develop the gluten enough, but...it worked out. If it's a relatively short bulk ferment and it needs more development then you can add in extra stretch and folds closer together. And vice versa. Adding in an autolyse really helps. One very big step in bread baking is knowing when the gluten development is sufficiently done. Well, and I'm fairly used to it from a kneading perspective. Mix it, knead it till you get a nice window pane, then do a few rests. But this method was just very different to me. I really had to trust the instructions because I was worried I'd get to the end and have no gluten development. Now that'd be some invention. I'd never be off this site if this was possible. Try the recipe out, it's a lovely flavour. and it being so cold in the Dark and Dreary this time of year, that you could have gone a lot longer than 9 hours from mixing. It must have been the rye and spelt that really sped it along. I'm thinking that this could also be a nice no knead recipe for those working. Just mix and let sit for the 8-9 hours at work and then do a gentle fold from the 4 compass points to shape when you get home - and then let proof for an hour and half before baking. That was my original plan. I just thought about it for too long before I put it together. And you're right the wholegrains did catch me a bit off guard and it sped along unexpectedly. I will be revisiting this loaf with further adjustments. This would make a lovely hands off no knead recipe for those who don't have time. Just needs to be fine tuned for ones schedule. I just checked. It is supposed to be in the high 50's and low 60's overnight here, a real shocker, so I am going to get a 4% whole grain levain going and see if I can do a no knead overnight for 10-12 hours by putting it outside:-) Maybe put 6% more whole grain in the dough flour at 75% hydration.